A radio wave is an electromagnetic (EM) wave with frequency characteristics that make it useful. The wave travels long distances through space (in or out of the atmosphere) without losing too much strength. An antenna is used to convert electric current into a radio wave so it can travel through space to the receiving antenna, which converts it back into an electric current for use by a receiver. All matter has a varying degree of conductivity or resistance to radio waves. The Earth itself acts as the greatest resistor to radio waves. Radiated energy that travels near the ground induces a voltage in the ground that subtracts energy from the wave, decreasing the strength of the wave as the distance from the antenna becomes greater. Trees, buildings, and mineral deposits affect the strength to varying degrees. Radiated energy in the upper atmosphere is likewise affected as the energy of radiation is absorbed by molecules of air, water, and dust. The characteristics of radio wave propagation vary according to the signal frequency and the design, use, and limitations of the equipment. A ground wave travels across the surface of the Earth. You can best imagine a ground wave’s path as being in a tunnel or alley bounded by the surface of the Earth and by the ionosphere, which keeps the ground wave from going out into space. Generally, the lower the frequency, the farther the signal travels. Ground waves are usable for navigation purposes because they travel reliably and predictably along the same route day after day and are not influenced by too many outside factors. The ground wave frequency range is generally from the lowest frequencies in the radio range (perhaps as low as 100 Hz) up to approximately 1,000 kHz (1 MHz). Although there is a ground wave component to frequencies above this, up to 30 MHz, the ground wave at these higher frequencies loses strength over very short distances. The sky wave, at frequencies of 1 to 30 MHz, is good for long distances because these frequencies are refracted or “bent” by the ionosphere, causing the signal to be sent back to Earth from high in the sky and received great distances away. [Figure 9-1] Used by high frequency (HF) radios in aircraft, messages can be sent across oceans using only 50 to 100 watts of power. Frequencies that produce a sky wave are not used for navigation because the pathway of the signal from transmitter to receiver is highly variable. 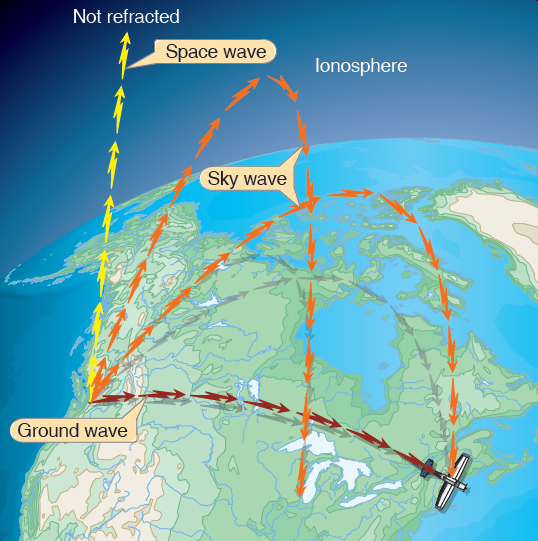 The wave is “bounced” off of the ionosphere, which is always changing due to the varying amount of the sun’s radiation reaching it (night/day and seasonal variations, sunspot activity, etc.). The sky wave is, therefore, unreliable for navigation purposes. Figure 9-1. Ground, space, and sky wave propogation. For aeronautical communication purposes, the sky wave (HF) is about 80 to 90 percent reliable. HF is being gradually replaced by more reliable satellite communication. When able to pass through the ionosphere, radio waves of 15 MHz and above (all the way up to many GHz), are considered space waves. Most navigation systems operate with signals propagating as space waves. Frequencies above 100 MHz have nearly no ground or sky wave components. They are space waves, but (except for global positioning system (GPS)) the navigation signal is used before it reaches the ionosphere so the effect of the ionosphere, which can cause some propagation errors, is minimal. GPS errors caused by passage through the ionosphere are significant and are corrected for by the GPS receiver system. Space waves have another characteristic of concern to users. Space waves reflect off hard objects and may be blocked if the object is between the transmitter and the receiver. Site and terrain error, as well as propeller/rotor modulation error in very high omnidirectional range (VOR) systems, is caused by this bounce. Instrument landing system (ILS) course distortion is also the result of this phenomenon, which led to the need for establishment of ILS critical areas. Generally, space waves are “line of sight” receivable, but those of lower frequencies “bend” somewhat over the horizon. The VOR signal at 108 to 118 MHz is a lower frequency than distance measuring equipment (DME) at 962 to 1213 MHz. Therefore, when an aircraft is flown “over the horizon” from a VOR/DME station, the DME is normally the first to stop functioning. Aircraft flying with one wing low while using the autopilot. Inoperative very-low frequency (VLF) navigation system. Weak transmissions and poor radio reception.